Our new, beautiful location is adjacent to the Tobu Train station; less than one minute walk. 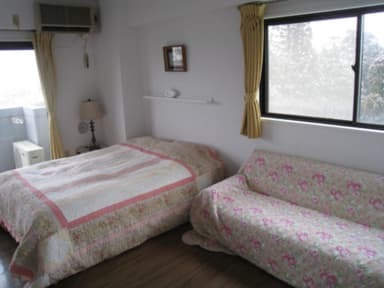 At the new location we offer comfortable western style private double bed rooms, private twin bed rooms, mixed & female dorm style sleeping, suite room with both Japanes style Tatami room & western style 3 beds room for 5 person. 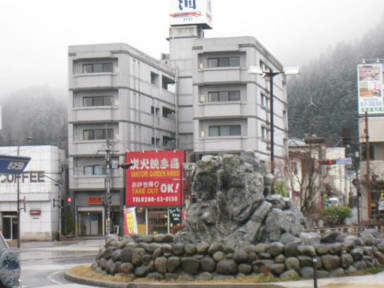 We can accomodate single travelers, couples, small groups and families looking for a truly Nikko experience. Please join us in our brand new Monkey Dragon Cafe and Bar just below the hostel. Our delicious home cooked traditional cuisine is tasty and resonable price. We offer wine, sake, and imported as well as locally brewed beers. We also provide tours of the Nikko area. These tours are a wonderful way to get a local's view of the most fabled natural beauty in Nikko. From Autumn leaf, to snow capped mountains, this tour is rewarding and enlightening during any time of the year. Check in is between 3pm and 6pm, if you need to check in after please let us know in advance either by email or phone. Rooms are not provided with telephones. It was very easy getting to the location, and the staff was courteous and very accommodating. Clean facilities with a nice view of the mountains, I had a great stay and met some amazing people here! Plenty of space to hang out. Large kitchen and good facilities. Good place to stay for a night or two, a short walk from the train station and bus stop. For visiting Nikko it does the job. I had a last minute late check in and the staff was really accommodating. They were really nice. Great place to start a morning or evening run from in Nikko and by foot only 15-20 minutes away from the Shinkyo Bridge and world Heritage sites. Oh shops close early in Nikko so make sure you plan accordingly. By the way this is really close to the JR station. Great location, there was a bit of a musky smell some though. Small place with dated interior but a good location right next to the station and walking distance to the sights in Nikko. The bed was really comfy though! Good place to stay for a night or two. Great location, good value. Right by the station so you don't have to go far, easy to catch a bus or train in the mornings. No lockers for valuables or luggage, which was a shame, although they do have a locked area for everyone to store their luggage in case you want to leave it while you travel, but all guests have access to it. The dorm room walls are paper-thin (literally, they're shoji doors) but everybody was polite and quiet so I had no issues. Decent place to sleep, but nothing special. Good place to sleep for a night that’s about it, staff weren’t very friendly and annoyingly the only power points are no where near the beds. Beds were really comfy though! Would recommend if you’re pretty much only looking for a place to sleep and that’s it while exploring Nikko. Might be a good place to get a rest for one night but staying longer is uncomfortable: the kitchen is not welcoming you for cooking at all and in generell, it’s a really kind of weird place with weird atmosphere. We did not feel too comfortable staying here.